Woody debris is a natural component of streams, forming clusters and dams; slowing water velocity, trapping sediment, and creating a range of different in-stream habitats that are important for fish and invertebrates. Due to land use change and the legacy of river management practices which involved removing woody debris from rivers and streams, naturally occurring woody structures are often largely absent or reduced throughout catchments in England. 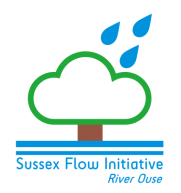 Sussex Flow Initiative aims to utilise cutting edge Natural Flood Management research to inform the reintroduction or 'installation' of woody structures of different designs in streams within the Ouse catchment. Individually the structures may look relatively insignificant, however collectively they can help to significantly reduce and delay the movement of water downstream during flood events. ​We have been working with landowners and smallholders, to support the installation of woody debris in small streams within the Ouse catchment. If you are interested in utilising these techniques on your land please get in touch. Banktop diverters are created by positioning and fixing large woody debris across the banktop in streams and ditches. These structures are only active during high flows when they hold water back and encourage it out onto the floodplain. Leaky dams are similar in construction to banktop diverters, with the addition of woody debris within the channel, meaning that these structures are active at all flows, but are constructed to allow fish passage. Leaky dams can also provide habitat and encourage more diverse spatial patterns of flow and substrate. Deflectors are constructed using large logs or living trees (e.g. willow) that do not span the full channel width, but are positioned to extend into the channel and are anchored or dug into the bank. They are particularly useful in larger streams and rivers where water can be channeled into temporary storage areas (floodplains, ponds) or at locations where the river has been historically straightened, as they can be used to encourage meander formation (where land use allows). ​Gully stuffing is typically used on ditches draining woodland, and uses smaller logs and brash positioned longitudinally to slow the flow of water and trap sediment. • We can 'install' woody structures in small streams or ditches of low-moderate gradient. • Ideally streams will have some surrounding woodland to provide materials.